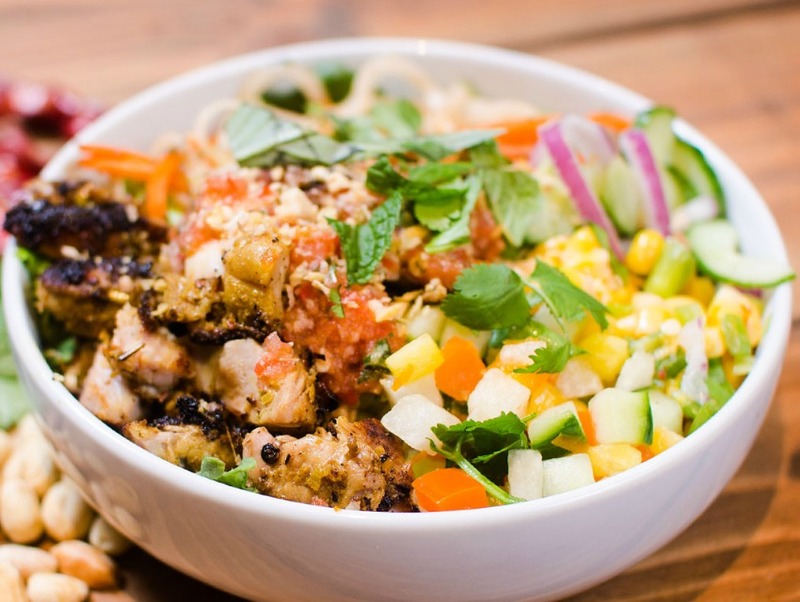 Kaya Street Kitchen serves bold, bright Asian food like a chicken satay bowl. What happens when you take the Chipotle fast-casual model, mix in the impeccable and obsessive tastes of the Southeast Asian kitchen, and cater to the sun-worshiping, kale-eating, SUP yoga-loving set? No, we’re not talking about Chipotle’s so-so ShopHouse Asian concept. Meet Kaya Street Kitchen, which opened in December on Fairfax Avenue near Beverly Boulevard. The quick-service restaurant–a cheery and unassuming space with the typical benches and counter-top eating of clean, contemporary cafeteria decor–is the brainchild of Yuli Miller and business partner Barry Tu. Born and raised in Samarinda, East Borneo, Miller, a former auditor, wants to give Los Angeles a taste of the food she grew up eating and loving. “My mission is to bring the flavors of Singapore, Malaysia, and Indonesia with balance,” says Miller, who’s creating made-from-scratch versions of Asian comfort food. But while there are hawker-stand influences, Miller’s sourcing and preparations scream California. Deciding between the coconut-lemongrass steak, the chicken satay, and the pork and shrimp lumpia-style meatballs made from Miller’s grandmother’s recipe might be difficult, but there’s zero cause for despair. The fully customizable menu lets you choose all of them in the Super Bowl option ($11) or in a trio of roti tacos or lettuce wraps. And after you include the astounding range of slaws or, of course, garlic kale, you’ll feel little guilt for blissing out on their namesake kaya toast ($3.65)–the voluptuous coconut jam is flavored by pandan leaves and finished with a perfect amount of salt.